Work Rehab is a treatment and rehabilitation centre for persons recovering from injuries and illnessess to ensure successful return to work. 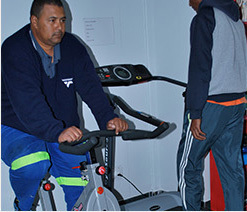 At Work Rehab we aim to match the employee’s capacities & limitations to that of the job requirements. A pro-active approach is used and the occupational therapists and physiotherapists work in close co-operation with doctors, occupational health nurses and employers.